In 1943, the CEO of IBM Thomas Watson predicted: “I think there is a world market for maybe five computers.” A statement that soon proved to be wrong. Fortunately, forecasting methods have improved over the last 70 years. These days forecasting is less of an art and more of a science than it used to be. The use of statistical methods and economic indicators has become a widespread standard. I find the sheer amount of estimations and numbers on the IoT market highly confusing. Yet, I think it is important to understand these figures in order to get a sense of the real dynamics of the industry. After all, big and small businesses as well as individual people use these forecasts to make important decisions about investments, product development, etc. 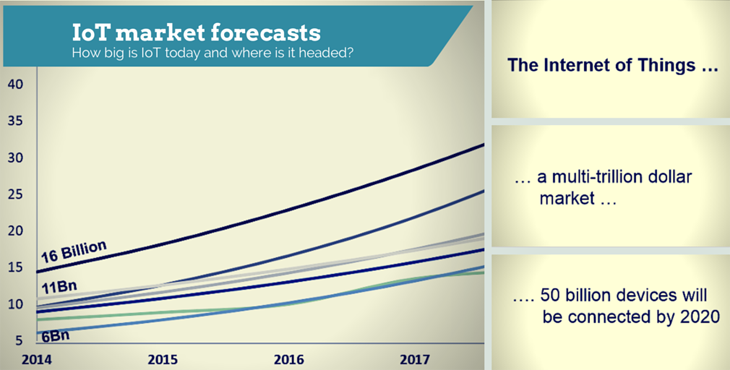 In this article I want to summarize all the major IoT-related market forecasts, visualize them in a clear way, and interpret them. I am hoping that it will help you understand the IoT industry better and make it easier for you to relate to the number. Please let me know if you have any additional input or ideas! In this article I will not dive into IP-traffic. I believe IP-traffic is rather intangible to most people. Moreover, it is closely correlated to the number of connected devices and less important for understanding the market. Two technology companies have published data around the IoT market potential in connected devices: Cisco and Ericsson. Both foresee around 50 billion connected devices by 2020. In addition, the global and established research companies Gartner, IHS Global Insight, ABI research and IDC as well as the specialized IoT research firm Harbor Research have developed their own forecasts. Today we have roughly between 6 and 14 billion autonomous connected devices or “Things” that are connected via some form of communication mechanism. These figures do not include smartphones, tablets, computers, and similar. The exact definitions of the research companies vary slightly. We will see a massive increase in connected devices in the next years. The expected growth rates are well beyond those of most other industries that are being forecasted (Annual growth rates ranging from 14% to 29%). For every person living on earth, there will be at least 2, maybe even 6 connected “things” by 2020. “Things” will clearly be the majority of all connected devices by 2020. Today the number of connected devices that are not “Things” (i.e. smartphones, computers, tablets, etc.) is almost equal to the number of connected things. (e.g., ABI says there are 7 billion smartphones, PCs and similar today). “Things” are expected to outgrow smartphones, computers, and the like by a landslide. The number of connected devices by 2020. The low estimate is 18 billion connected devices, the most bullish forecast states 50 billion devices. That is a massive difference of 275% from the point of view of the lowest forecast. One should note that both Cisco and Ericsson, who provide the highest estimate, have a direct interest to attain this number. Both are selling solutions in the IoT field and are betting on this industry. Therefore it is questionable how “objective” their forecasts are. The research companies have taken a traditional top-down modelling approach to evaluating these markets. Gartner for example describes it their methodology by saying they triangulated their forecast using three different approaches: A Long-Tail Product Category Analysis, a number-per-population study, and an economic envelope analysis. Cisco, however has taken a different approach. The company quantified the industry completely bottom-up. Cisco analyzed 50 use cases for IoT in the private sector, calculated these individually and then approximated their potential in case of a world-wide roll-out. Five companies have estimated how much revenue will be generated from companies that are active in the IoT industry: IDC, Visiongain, Harbor Research, Markets&Markets, and Gartner. We will see a massive increase in IoT generated revenue in the next years with double-digit growth. The starting point today: While Markets&Markets reports $129Billion of revenues in 2014, IDC already reports that it is a $2.3Trillion industry. That is an incredible difference of 1760% from the point of view of Markets&Markets. Clearly the definition of “Internet of things”-industry varies significantly. Where we are headed: While Gartner is talking about a $300Billion industry in 2020, IDC believes in a 7 trillion industry. To me, Gartner’s numbers appear extremely conservative. Apple, Google, and Facebook together generate an approximate revenue of $250billlion today. If Gartner was right then the whole IoT industry in 6 years will just be slightly bigger than these 3 companies today. However, there are hundreds of companies that are currently moving into this industry. Take General Electric for example. The company generates $150Billion in revenues today and is saying that it is now changing its strategy to become an “Internet of Things”-company. GE claims that it is already generating roughly $1billion in IoT-related revenues in 2014. The company is seeing a massive growth in this area. On the other hand, IDCs number appear extremely high: 7 trillion in 6 years. That is almost half the size of what the US economy is worth today (~$16 trillion). One should note that GE has also made a prediction about IoT revenue in the industrial field. However, I have not considered their numbers here because I find the forecasting method questionable. See also my article called: Why GE has not done its homework. Cisco, GE, Gartner, and McKinsey have published forecasts of the “value” of the Internet of Things for our economy. The definition of “value” differs for all forecasts. For Cisco it is “Value at stake”, for McKinsey “potential economic value”, for GE “potential global GDP for industrial internet only”, and for Gartner “global economic value-add”. Gartner, GE, and McKinsey give a forecast for the annual impact at a certain point in time (2020, 2025, and 2034 respectively). Cisco only provides a total of $ 19 trillion for “the next ten years”. No company gives a starting point and a growth rate. Therefore I have taken the growth rate of the device forecasts as a proxy to determine the value of all the years between now and 2034. IoT will have a massive economic impact. In both Cisco’s and McKinsey’s scenarios, the global value of IoT would surpass the total economy of Germany in less than 10 years. If GE’s high forecasts becomes reality, the value of the industrial internet in 20 years will roughly reach the size of the US economy today. Forecasts diverge a lot less when it comes to economic value than they do with connected devices or industry revenue. Because it is so hard to forecast economic impact, both McKinsey and GE have provided a high and a low scenario. It looks as though IoT will be the next big innovation and the world market will be a lot bigger than the “5 computers” that Thomas Watson predicted in 1943. For every person living on earth, there will be at least 2, maybe even 6 connected “things” by 2020. Creating revenue opportunities for companies beyond what Apple, Google, and Facebook are selling together today. Surpassing the economic output of Germany within the next 10 years. It’s amazing article!! Very informative. Appreciate your work, very informative blog on IOT. Hope it helps community here.